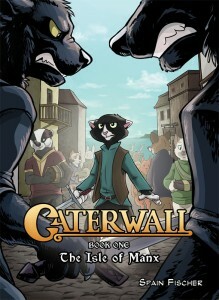 Caterwall is a fantasy comic series created, written, and illustrated by Spain Fischer. It’s had a convoluted creation and release history, on line and on paper, but now Sofawolf Press is offering the first of three planned full-color graphic novels. It’s called Caterwall: The Isle of Manx and it’s available in both hard and soft-cover editions starting this July. The story? Pax is a young cat in the peaceable Kingdom of Katia. He’s determined to become a noble, heroic knight like his famous father — but his antics and attitude mostly get him in trouble, and eventually get him banished. But he and his rag-tag band of friends are still determined to help the nearby dog kingdom in their war against the wolves of the north. Find out more over at the Sofawolf Press web site.